Let’s face it when you take a 20-month old toddler on a holiday / work trip, it is not like she needs a break from the monotony of life, or has been dying to see another part of the world. I am sure our daughter, Gabriella, would have got a similar amount of pleasure if my husband and I had taken two weeks off work and been with her the whole time letting her play with her toys, enjoying her food and generally just making a mess of the entire house. Nevertheless, go on holiday we did – because we needed a break – a two-centre trip to Boston and San Diego / Los Angeles. We wanted to go there and thus Gabriella was obliged to come with us. There were all sorts of concerns I had about the trip – the flight – Would she be upset during take-off and landing? Would she sleep? Were there appropriate facilities on board for a toddler? The holiday – what would we do in the evenings when she was asleep? How would I ensure she got her daytime nap? Would she play up? As I will explain, we got through all these things quite well – however, there was one consideration that we did not think of – more of that later. So the flights – we opted for British Airways. We went on the various mother and baby websites and these reassured us that BA were very good with kids. And indeed they were – we were priority boarded, were offered bulk head seats, were given a bouncer for her to sleep in, a belt so that I could strap her round me when we took off, and a Paddington Bear suitcase so that she could throw crayons on floor which kept her occupied for quite a while. The staff on board were also very helpful. Of course, even with all these facilities the flight was not the best time she has had in her life, but they did make it bearable and transatlantic sectors generally went well for us. It helped that Gabriella has, even if I say so myself, a pleasant disposition and even on take-off and landing she did not complain. However, going from Boston to Los Angeles (a six-hour flight) was an altogether different experience. We went United Airlines. We were not priority boarded, we did not have bulk head seats or ones with extra space (although to be fair these are often the emergency exits – banned for little ones. We did not have an extra seatbelt (apparently these are dangerous according to the US authorities but not those in the UK), a bouncer or a Paddington Bear fun pack. Indeed it was not surprising that there were no other babies on the flight. This meant that Gabriella sat on either one of us for the entire flight. She was good, but it was difficult and an experience that we would rather not repeat. We opted for most of the holiday to stay in a seaside apartment in Oceanside just north of San Diego. An apartment makes great sense for anyone with a child. It means that the little one has plenty of space to roam around in during the day and when she is asleep her parents can do as they please, without fear of waking her up. Sea World, a most absorbing experience for the parents, was not far away. For a couple of nights we did stay in a hotel. However, we were surprised that when presented with the bill we were asked to pay USD15 per night for the travel cot supplied. There seems to be the general trend in the US at the moment that you are asked to pay extra for everything (USD10 per day for a child’s car seat from the car hire company – we brought our own, USD4 to rent a trolley at the airport, USD15 to park the car at Sea World). With a 20-month old the hotel room is a mess within two minutes (Gabriella has a desire to move shoes from one place to another, and clothes, leaflets and anything else she can lay her hands on) – the apartment worked much better for us. America, as you would expect, is generally a child-friendly country. Sea World especially was a doddle, with wide avenues and great changing facilities. She enjoyed San Diego Zoo, but you cannot take the ‘stroller’ everywhere so you end up walking long distances to get to the same places as everyone else. 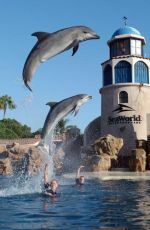 What was surprising at these major attractions was that we were asked to leave our ‘stroller’ in a given place for 15-30 minutes whilst we went to see an attraction (eg the Shamu show). We just left our stroller unlocked, went to the show and came back and it was still there in one piece. Does that happen at British attractions I wonder? I think it was a sign of the generally trusting nature of the American people and also perhaps a sign that petty theft in this sort of place is minimal. Our visits included historical Boston and the Queen Mary ship on Long Beach – and these like many others I suspect are all possible places to visit with a wee one as long as you ask for an ‘elevator’ and not a lift. But there are free things to do with a child, which are just as great. She of course, loved the beaches (as indeed did her parents). Clean and beautiful you just could not go wrong. We also donned our baby rucksack carrier and went on some lovely hikes – Torey Pines being an example of short hikes that are an easy drive from San Diego. Southern California has some beautiful terrain and high up in a rucksack Gabriella loved the views. So when we landed at Heathrow I was relieved. We had had a great holiday. Gabriella had been good on all the flights. She had got used to the new pattern of her day quite quickly (ie sleep when she got the opportunity and stay up quite late) and all was well. However, what we did not account for was that between LA and London is an eight-hour time difference. Although adults can gently acclimatise to this new change because they are aware of the time difference, a little one has no accounting for why she feels wide awake but mummy and daddy want her to go to sleep. After three nights of being up for four to five hours we decided enough was enough and let her scream for a couple of hours. Eventually she fell asleep. Cruel is kind – she had to get used to the new hours, but we did feel sorry for her. I am not sure if there was another way. So – holiday with a child – yes. But if there are large time differences make sure that you are not going to work for a few days following your return (it is a good idea to come back on a Friday) because you might not have gotten any sleep.